She’s the epitome of every guys’ nightmare. She’s different. She’s insecure. She feels unpretty all the time. She’s jealous every time you talk about “her” but she still listens. She looks at you but retreats whenever you look back. She thinks of you like you’re the most important person in the whole world. She laughs but inside, she’s dying. She used to dance all night long but now, it’s always sad love songs. She shows everyone how it is to pretend that every thing is fine. She may be showing the world her smile but she is empty. She will never be the same. She will never be the girl you give your heart to. 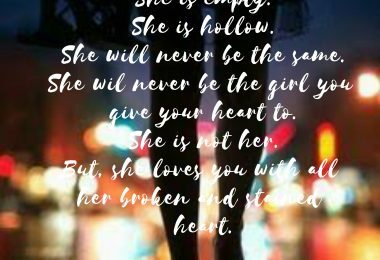 But, she loves you with all her broken and stained heart.